In which I try and convince you that puppets are people too, talk about the power of the human voice, and hopefully not offend too many documentary makers. Not too long ago, I worked on a wonderful documentary project called Dating The H*Bomb, a half-hour program that screened on ABC2 here in Australia. It was a fascinating and unusual project for two distinct reasons. First, it was about how people unexpectedly diagnosed with (cough) genital herpes (cough) go about looking for love. Second, it told those people’s stories using (cough) puppets. Now, there’s lots to say about the first point, but you can go watch the documentary for that. The second point is what I’m here to talk about now. The director (and good mate) Jay Court and I workshopped a number of ways to tell the Dating the H*Bomb story. Our ultimate decision was born out of a not uncommon dilemma in documentary — we wanted to share the stories of people who were willing to be heard, but unwilling to be seen. Wasn’t that the greatest!? This short film won Park the first of four Academy Awards in 1990 (for Best Animated Short Film). You can watch his award acceptance speeches here. What is so tremendous about this little film is not just that it used clay-mation (stop animation using clay models), but that it took real people’s voices and opinions and visually re-presented those opinions as those of anthropomorphised animals. There is so much to see in these characters. The voices are distinctive in themselves, but coupled with the novelty of animated zoo animals, the proverbial mind is blown. We laugh at the Brazilian lion not understanding why there’s not enough meat in this foreign British zoo, and we giggle at the elderly tarsier with glasses who confesses she’s looked after well in her cage. The result is both hilarious and haunting, especially when you know the process the filmmakers underwent. These are not the scripted voices of actors, but real people interviewed about (amongst other things) their experiences living on a housing estate or in a nursing home. When their real thoughts are given voice through animals trapped in cages, it is on some levels devastating. Park has made a powerful, yet completely entertaining and engaging, statement about humanity. Crank Yankers is a somewhat different kettle of fish. According to that bastion of truth and knowledge Wikipedia, well-known American comedians including Jimmy Kimmel, Sarah Silverman and Wanda Sykes take on comic personas then proceed to crank call random strangers (i.e. real people) to see how long they can fool them for. As it’s completely illegal, not to mention unethical, to record phone conversations without the formal consent of both parties in most US states, the production team organised for the comedians to be flown to Nevada to make their calls. Apparently in Nevada, you only need one person on the call to consent to the recording. 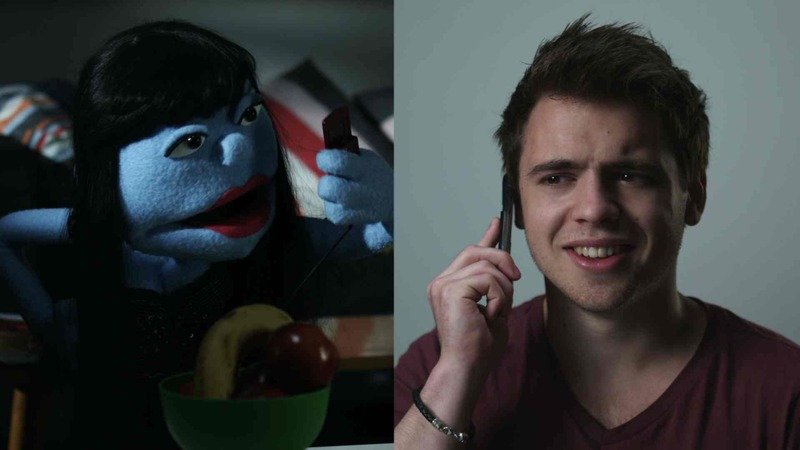 The audio recordings of these calls are then dramatised using puppets, often with great creative license, and cut together to give us one of Comedy Central’s most enduring comedy hit series. Can you see where this is going, kids? Take a look at this short clip (my apologies for not being able to embed it). We all know the saying, ‘It’s not what you say, it’s how you say it.’ I couldn’t agree more. So much of how we communicate is conveyed through the smallest of movements and spoken nuances. Tiny facial reactions, imperceptible quavers in speech. How many times have you walked away from a conversation feeling like what was said wasn’t at all what was meant, or that what was shared was so much more meaningful than the words actually spoken? In documentary, we traditionally rely on filming real people speaking their truths to camera to allow us access to their thoughts and feelings, and so there is a subtle prioritisation of visual content. In fact, we use the medium of film to isolate and exaggerate those unspoken truths in interviews. We linger on a gaze, zoom in on a tear, cut out a comment or facial expression that may or may not ultimately change the way a viewer will see a story. That is the purpose of storytelling, in both scripted and documentary forms. To contain and tell the higher truth to be told, to communicate with an audience a message or a question that resonates with something distinctly human in as accessible a way possible. I can’t say that I’m a psychologist or behavioural therapist so my opinion doesn’t come from science at all but purely from my own experience. A puppet is never going to give you the amount of physical detail, texture and movement that human facial muscles do, but I would argue that’s not always necessary, particularly when the human voice comes into play. It is a strange compulsion of humans that we are so easily entranced by moving inanimate objects. It’s just so damn easy to fall for a puppet. We are mesmerised by these strange objects, happy to be rapt up in wonder when they begin to move and react and ‘see’ us too. Ask any puppeteer and they’ll confirm that when they’re working a puppet, despite they as a performer may be completely within plain sight, it is the puppet that other people talk to and interact with. A bit like if your cat and dog just got up on their hind legs and started quoting Shakespeare. It’s hard to ignore. Puppets then can become compelling tools for storytelling, when by design or necessity, the human voice is detached from the human face. When we see a puppet being performed, lip-syncing to the words of a real human voice, we hear that human voice in a different way, and perhpas more acutely than we would otherwise. We also I think project our own emotions onto those puppets, our brain’s way of plugging up the logic holes, and so we see what we want to see. We can look at The Grouch from Sesame Street and immediately see his frustration, his bitterness, his inherent grouchiness. We don’t need him to frown or scrunch up his nose. We don’t need to see the tendons in his neck tense and pulse, or his forehead bead with sweat. We hear his grouchy voice, we see his one straight thick eyebrow and we know everything we need, and much, much more. The human voice is one of the most powerful tools we have as storytellers, and it is often what makes great screen stories so powerful — documentary or otherwise. Putting a puppet in the picture, can I would argue, heighten our experience of the human voice. The potential power of this should not be dismissed. We would all like to think of ourselves as community-minded, open people who care about those less fortunate than ourselves and the social issues that impact the wellbeing of those around us. But, in the world of documentary, where stories like these are being told all the time, we should be a little more honest with ourselves. If we are truthful, we all know people (ourselves included) who come across a ‘traditional’ documentary, about something they really have no immediate connection to, and quietly groan. Unless there is some compelling reason to watch these types of stories, we do not expect to be entertained by a documentary. And by ‘entertained’ I mean moved, engaged and positively challenged. We expect instead guilt, pain, deflation, a reminder of our own apathy and insignificance — the opposite of entertainment. This is demonstrably not the reality of a lot of documentary stories, but it is an association still alive and kicking in our collective consciousness, and a hard one to shake for a lot of people. Before I risk offending more of you, what I am really trying to say is: sometimes getting people to watch documentaries is really very hard. Is it surprising then that filmmakers look for different ways to tell their stories? Different ways they can get an audience ‘in’ and so give their stories a greater chance of being properly heard? Alternative production techniques — innovative camerawork, an ‘everyman’ presenter, animation, graphics, puppets, dramatisations, reconstructions, whatever — are ultimately about one person trying to communicate a particular truth to another in the best way possible, and some of us will explore more unusual ways to get a message across if we feel the need to. Just for a few moments if nothing else, a puppet performing the real words of a real person inadvertently forces us to listen to what is being said; as the puppet persona is visually judged (usually favourably, as we collectively associate puppets with fictional and ‘fun’ stories), we refrain from judging the words themselves quite so quickly. Puppets, in whatever shape or form they come, are then a powerful way to communicate otherwise unpalatable or difficult subjects because of this inherent ability to disarm us as an audience, exploiting our expectation of entertainment, and so helping us to reframe our thinking in a way that is open to hearing truths that perhaps would be otherwise discounted or ignored. So, puppets can be people too. And in my opinion, sometimes they’re the only kind of people other people are willing to pay attention to. Creature Comforts was adapted into a successful television series of the same name, using the same method of candid real-world interviews paired with clay-mation animals. You can watch a whole bunch of wonderful clips at the Creature Comforts Youtube Channel here. Crank Yankers‘ official Comedy Central site can be found here. Stills courtesy Dating The H*Bomb, which was produced by Lala Pictures.